Just sharing my experience so that other people won't make the same mistake, or if they do they may have a way out of it if returns are not an option. I did a little research on short shifters prior to starting my swap and found that for the most part the Pro 5.0 was a very popular choice, though many people complained of its noise level. 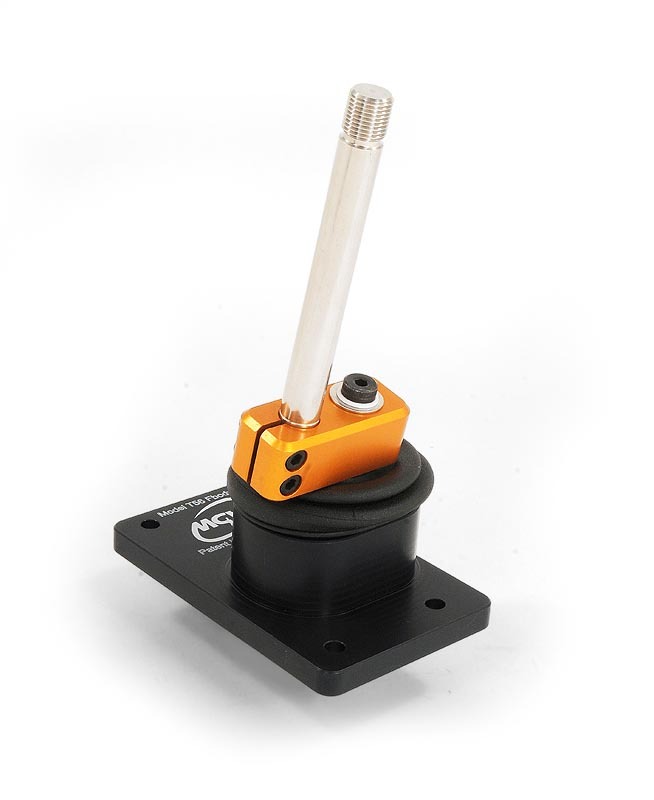 A lot of users commended the MGW shifter for being much quieter than the Pro 5.0 but similar in smoothness of operation, length of throw, quality, etc. The prices weren't drastically different, maybe +$30 for the MGW over the Pro 5.0, so knowing nothing more I went with the MGW. You can see how the Pro 5.0 shifter is basically a stubby "blade" coming up from the centerline of the shifter with two cross-holes that mate to a handle. This setup keeps the shift knob pretty well centered on the center of the transmission. 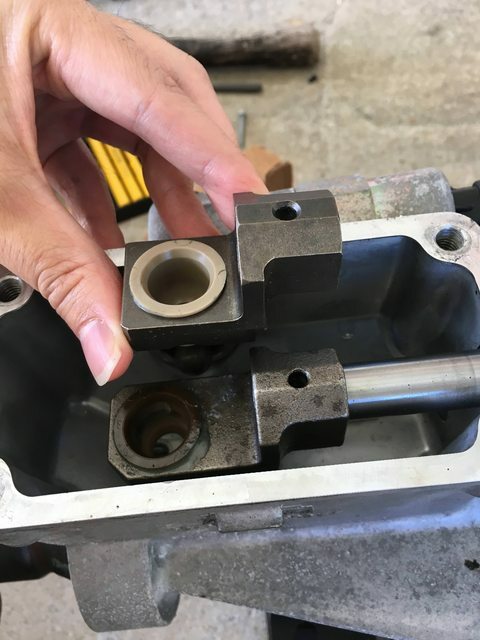 Well, the MGW by design is different in that it uses this offset block/shoulder bolt combo to connect the shift handle to the shifter mechanism. This effectively gives the shift handle a 1.2" offset from the centerline of the transmission. This offset is what causes the problem. When using the Import Muscle trans mount kit and methodology, the centerline of the trans lines up to the centerline of the shifter hole in the body of the S2000 pretty well. 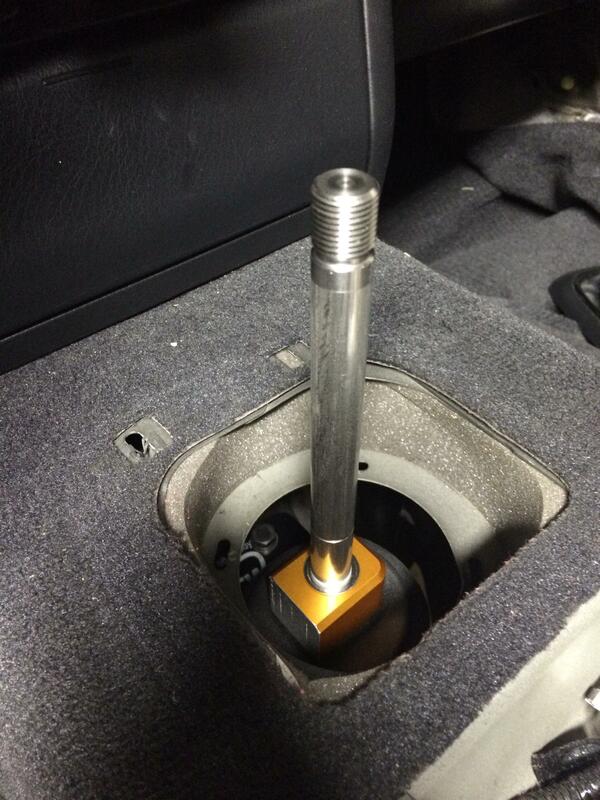 The 1.2" offset of the MGW shift handle then creates an interference with the shifter hole in the body of the S2000. Selecting 1st/2nd is impossible. 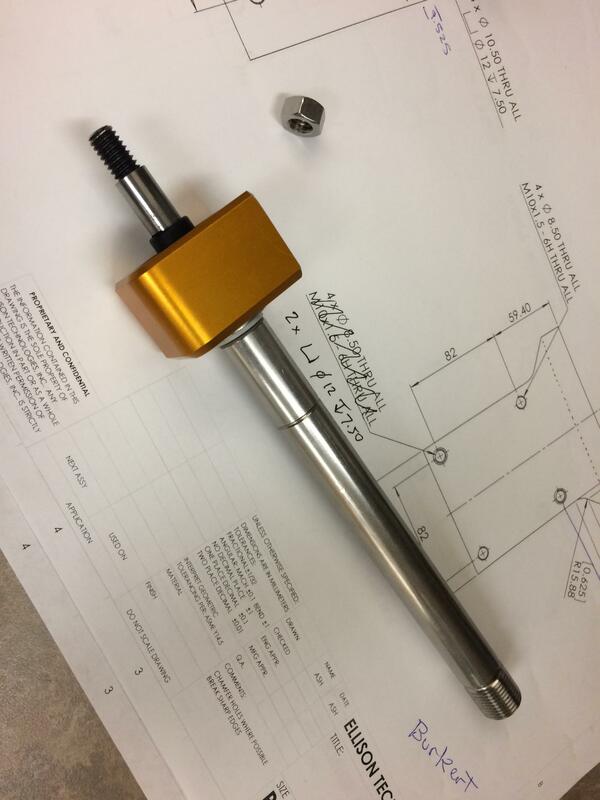 The offset block/handle assembly can be rotated, but only in 90 degree increments due to a tapered-square bushing that connects the offset block to the rest of the shifter mechanism. With the block rotated 180 degrees, selecting reverse is impossible. Rotating 90 degrees or 270 degrees would make either 1-3-5-R or 2-4-6 impossible to select. So the choices are three-fold. I didn't want to modify the shifter hole in the body of the S2000 mainly for structural reasons. This area is already a bit compromised due to the Import Muscle transmission mount method and its generally a crappy area to have to work in. Tough to get cutting tools in the area. I really liked the MGW shifter and didn't want to return it, so I went about modifying it to work. 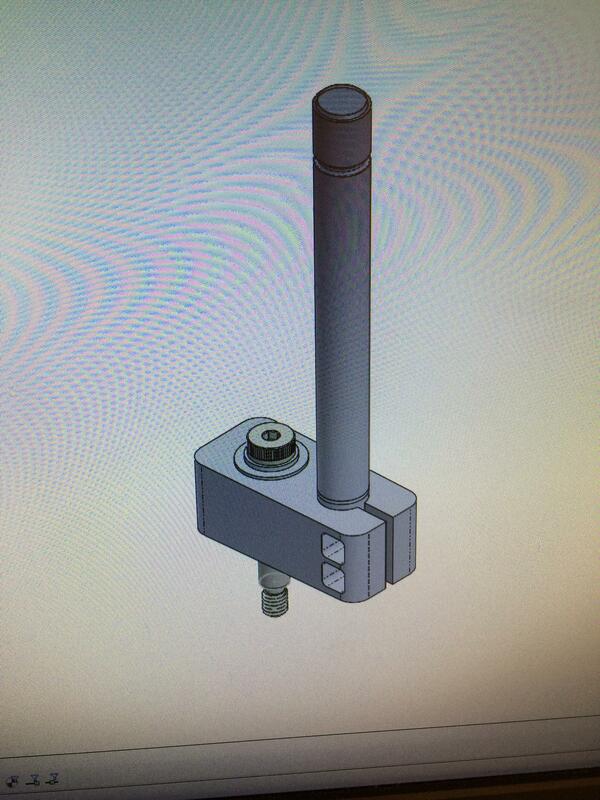 I modeled the thing out in Solidworks. 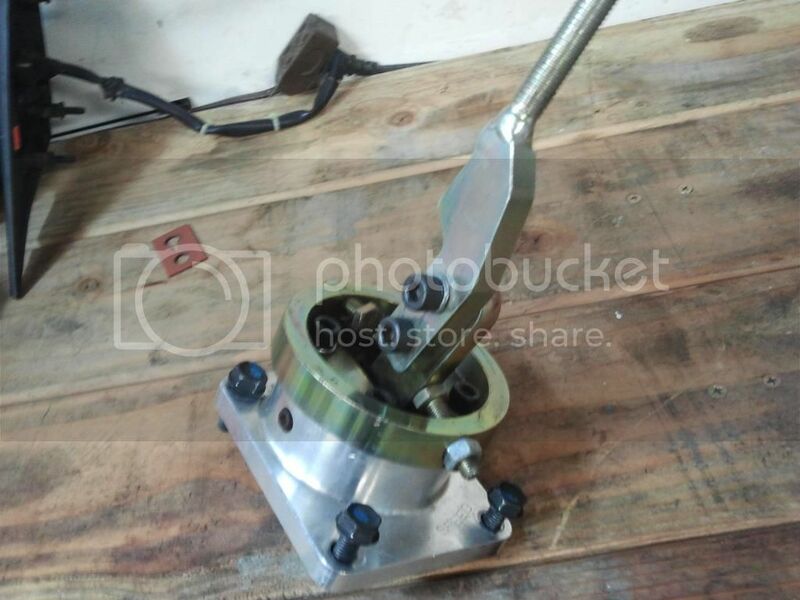 Basically it uses a 2" length shoulder bolt with some washers, the aforementioned tapered rubber bushing, and a rubber sleeve bushing to center up on the mating hole in the shifter mechanism. My hope was that I could re-create this shoulder bolt setup but basically make it come straight out the bottom of the shift handle. 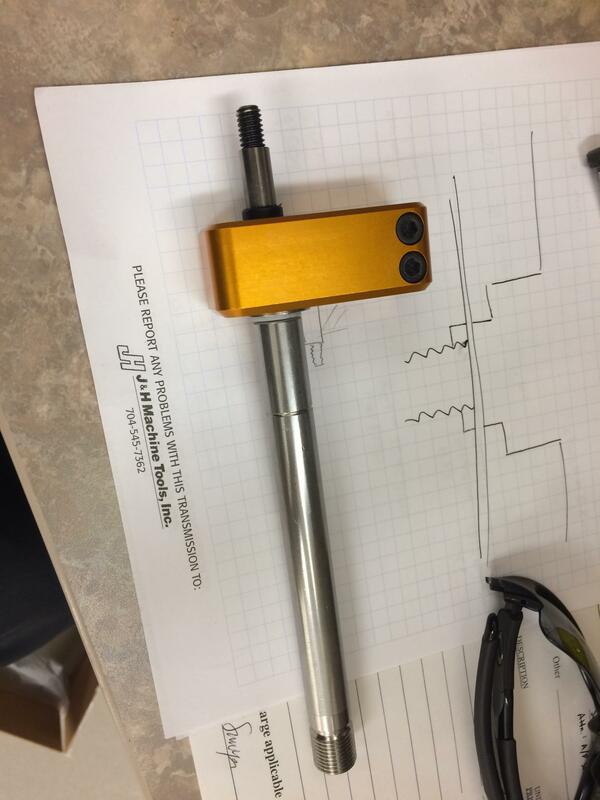 After a quick search on McMaster, I found a 5/16-18 3.5" length threaded rod (p/n 90322A675), a pair of 1" long 3/8" sleeve bearings (p/n/ 2868T58), a 5/16-18 tap and corresponding drill. Setting up the shift handle in a manual lathe, I drilled 1.5" deep and tapped 1" deep into the bottom of the shift handle, then threaded the 5/16-18 rod into this hole so that there was exactly 2.5" of thread protruding. This would be equivalent to the overall length of the shoulder bolt I was replacing. I used blue thread locker and two jam nuts to tighten this down securely. 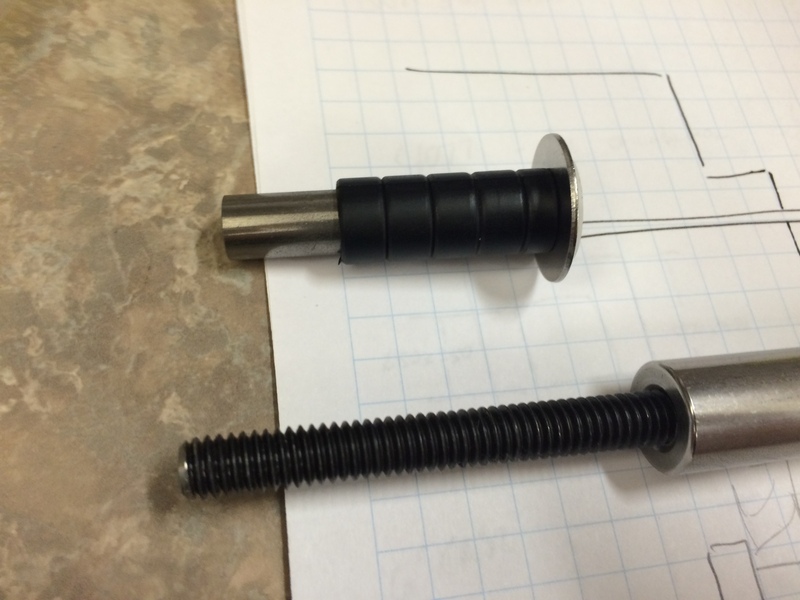 Then I reused the two washers that came off the original assembly, slid the two McMaster sleeve bearings on to act as the "shoulder" from the shoulder bolt, slid the original rubber sleeve bushing over everything, and that was that. The only thing left to do was to chop the beautiful, orange annodized offset block in half to give proper clearance for the S2000's shift hole. 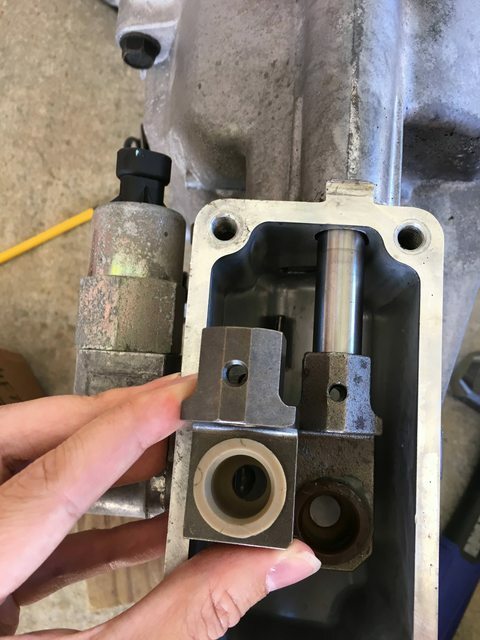 The assembly as shown basically took the shoulder bolt that held the block down to the shifter mechanism and recreated a similar "shoulder bolt" coming straight out of the bottom of the shift handle. The bottom of the shift handle effectively acted as the bottom of the shoulder bolt's head. All that was left was to use two M16x1.5 jam nuts on the shift knob threads to tighten the assembly down onto the shifter mechanism (which was already mounted to the transmission). I used blue thread locker on the end of my new assembly as well. So there we have it. A cautionary tale against buying the MGW short shifter for a T56-equipped LS swap. The modification was not difficult, but a Pro 5.0 would have worked out of the box. Even though this MGW unit seems to shift well, I'm not sure I could recommend it in this scenario versus the Pro 5.0 that would work without this much trouble. But, if you enjoy banging your head against a brick wall for no reason, then go for it! Interesting because I've got the MGW short shifter in with no issues on my 2004 GTO LS1/T56 swapped S2000. Only thing I had to do was purchase the f-body shifter offset. What mounting kit did you use for the LS swap? Interesting. Perhaps it was this f-body shifter offset that fixed the issue? Finally got around to uploading my pictures I've taken throughout my progress. Here are some comparisons between the f-body and gto offset shifters. Notice how the f-body offset shifter is shorter. Axialflow Shortshifter review and problems - Will shift knob fix the issue?